Enjoy learning a variety of media, styles, and techniques in a relaxed atmosphere. Eliz will demonstrate something new each wek, inspired by famous artists and movements. Then she will provide guided practice in creating an “Art Trading Card,” such as baseball trading cards. Eliz provides all media necessary, but feel free to bring that which you want to try. Class meets Thursdays from 10:00-12:00 am. Fee is $25.00 per class, including materials. Please contact Elizabeth at elizrosescho@gmail.com or (321) 292-9782 to register. Enjoy learning time-tested methods for creating naturalistic and expressive drawings beginning with the fundamentals. Eliz teaches creative projects that help you explore a range of media and subjects such as three-dimensional form, composition, and the figure. Here, you will develop representation of life under Eliz’s patient guidance. Eliz provides all media necessary, but feel free to bring that which you want to try. Class meets Tuesdays from 10:00 - 12:00 am. Fee is $25.00 per class, including materials. Please contact Elizabeth at elizrosescho@gmail.com or (321) 292-9782 to register. 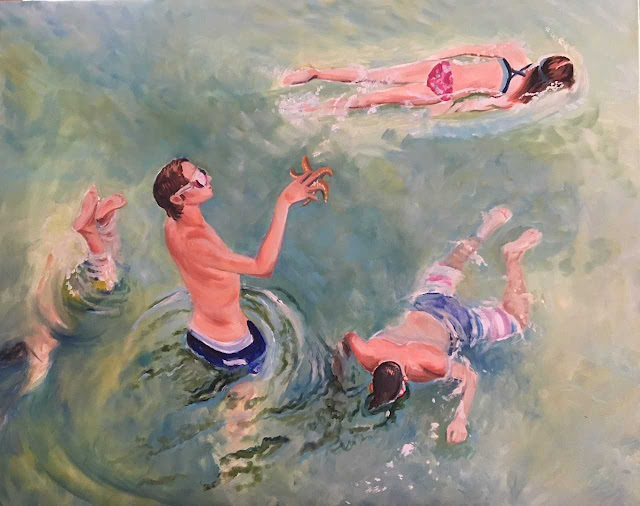 “Painted Vacations” , a 3 day watercolor workshop with Kathy Rennell Forbes will be held at the Studios of Cocoa Beach January 9 - 11, 2019 from 10 am to 4 pm Students will work with photos they have taken of a vacation or favorite place to create unique paintings. Each day begins with a landscape watercolor demo followed by individual instruction with each student. The class will focus on composition, value, and color. If weather permits and students are interested we will spend one day painting outdoors. Students should have some watercolor experience. 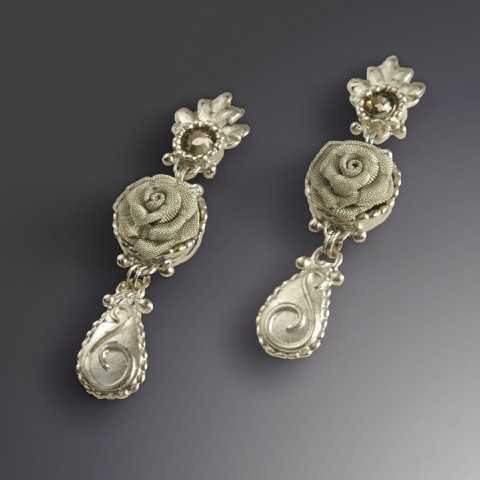 Kathy Rennell Forbes is an award winning international artist and instructor based in Atlanta. Kathy is beat known for her plein air watercolors. She is a 2017 Olmstead Plein Air Invitational “Master Artist” and a Signature Member ans past president of the Georgia Watercolor Society. She has BFA in Art and Art Education from the University of Georgia and continues to enhance her skills by attending annual workshops. 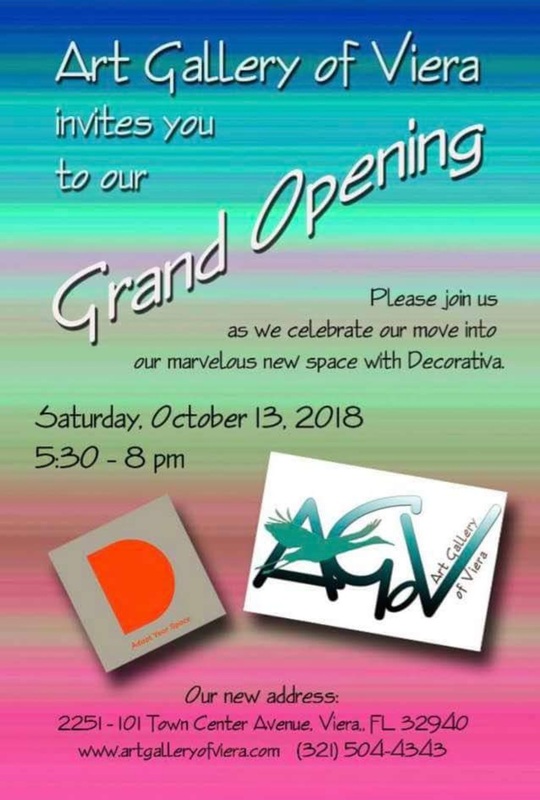 Gromling also said several of his artists are planning to use his gallery’s frame shop because it will be easier and less expensive than going elsewhere. Gallery artists will pay just a small percentage over the actual cost of the framing, thereby saving artists a considerable amount of money each year while helping defray the gallery’s overhead expense. 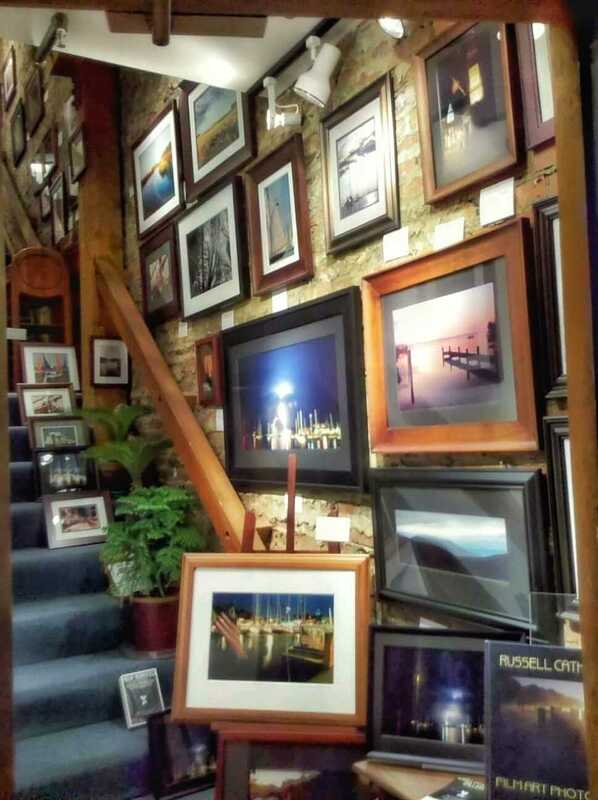 Also, in appreciation for their business, the gallery will offer framing services to its clients at special “client appreciation” prices below normal retail. Give the gift of art and support Cocoa Beach’s non –profit art cooperative. Visit the Studios of Cocoa Beach for a large selection of Santa approved holiday items. 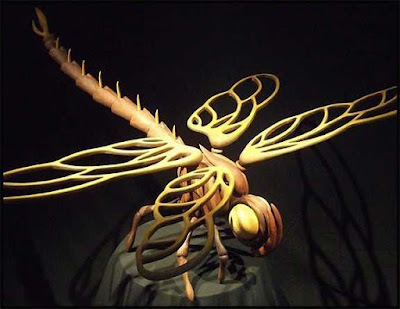 Member and guest artists will display a wide array of unique, handcrafted items sure to thrill any recipient. 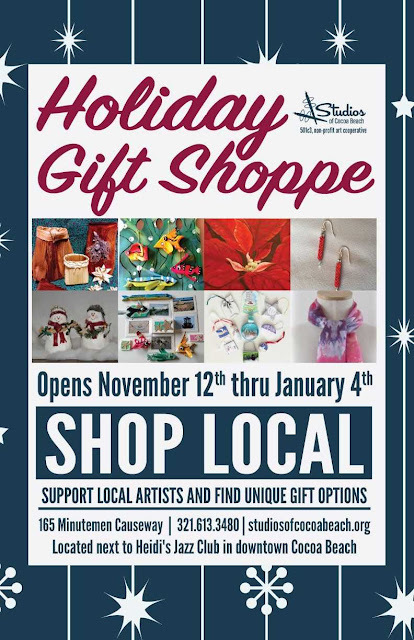 One of a kind gifts include hand crafted jewelry, ornaments, ceramics, shell art, palm fiber fish, petite paintings, greeting cards and more. This holiday collection of affordable treasures will fill the Studios from November 12, 2018 through January 4, 2018 during regular studio hours. 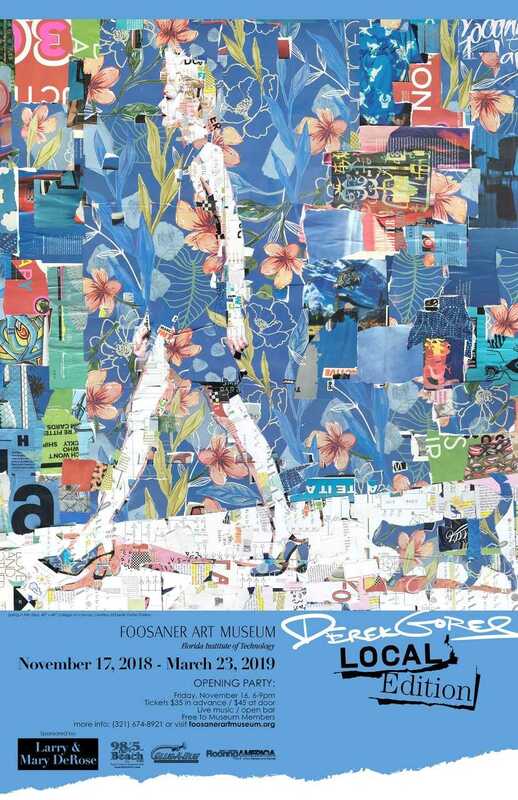 The Foosaner Art Museum presents Derek Gores: Local Edition, a mid-career retrospective of work by Melbourne resident, Derek Gores. Internationally renowned for his vibrant collages built from magazine scraps and snippets, Gores was honored to have his work selected for the Manifest Hope DC exhibit coinciding with the Presidential Inauguration in 2009, and in 2010 he was named “One of the 40 important artists of the New Contemporary Movement” while in an exhibition in London. Local Editionoffers the best of Gores’ most recognizable work, alongside new pieces created specifically for this hometown exhibition. Please join us at the festive First Friday Opening Reception for the 36th Annual Designers' Holiday Craft Show on November 2, from 5:30 through 8:30 pm at Fifth Avenue Art Gallery. This year's event opens today, October 29, and will run through January 5, 2019. Plan to come and jump start your holiday spirit, meet some of these wonderful crafters, share in some light refreshments and enjoy the beautiful collection of handcrafted artisan work. 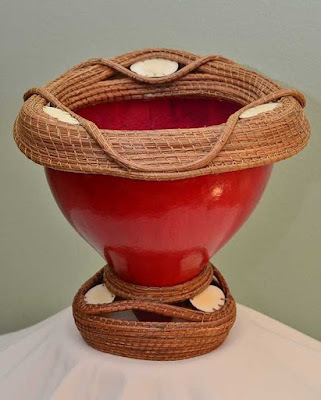 There will also be a drawing for a gift basket at the Opening Reception. The drawing will be held at the close of the evening and the winner will be notified by email. 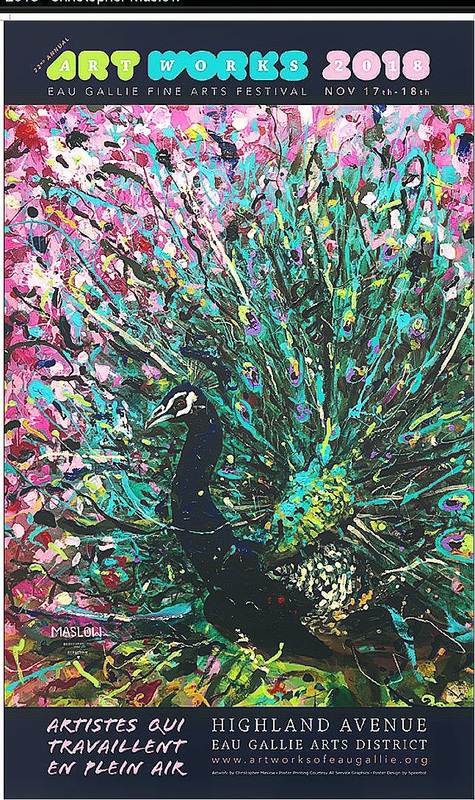 Fifth Avenue Art Gallery is located in the Melbourne Eau Gallie Arts District. 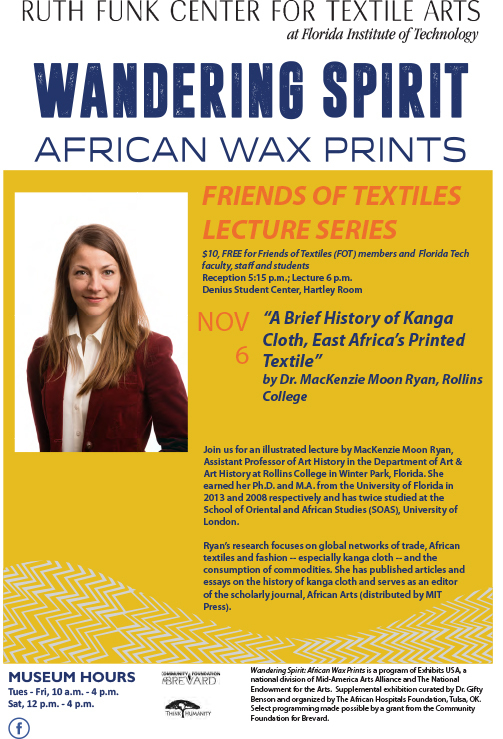 All events are free and open to the public. Gallery hours during this exhibit will run Mondays through Saturdays, 10 am through 5 pm. The Studios of Cocoa Beach, 165 Minuteman Causeway in downtown Cocoa Beach, will hold an opening reception for their annual Members Show and “Friends & Family” Exhibit on Friday, November 23, 2018 from 6 to 9 pm. 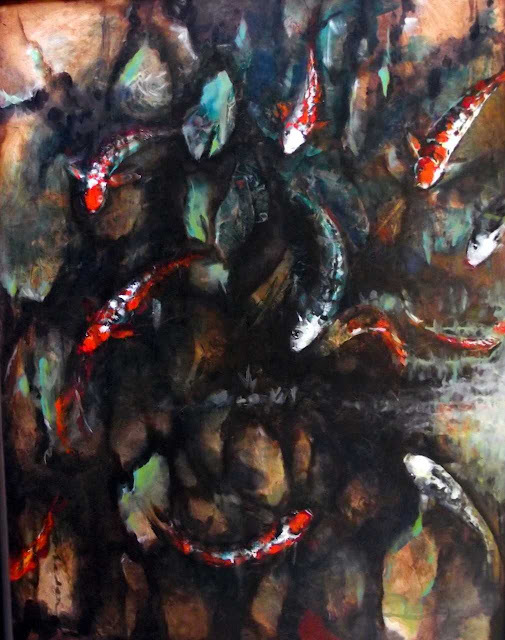 Resident artists will display the best of their current work and compete for awards including the Award of Excellence . The show will be judged by sponsor Dan Striby of Sterling Photography in Melbourne. 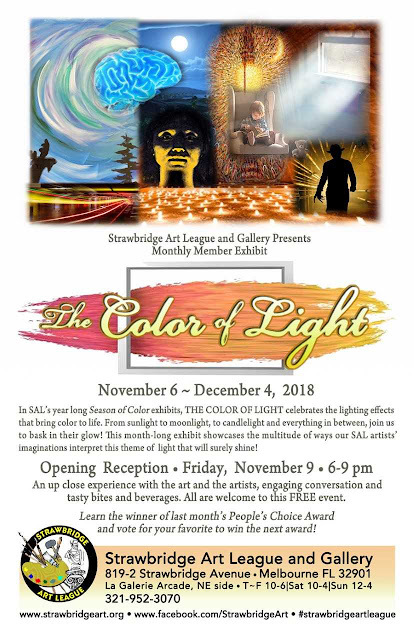 Visitors can also vote for their favorite piece with the winner being awarded the People’s Choice Award also sponsored by Sterling Photography. In addition to entering a piece in the exhibit, Studio artists can invite a friend to share their studio space , ensuring that you will view a mix of art by 40 plus local artists: Painting, jewelry, pottery, sculpture, watercolors, photography, fiber, printmaking and more. 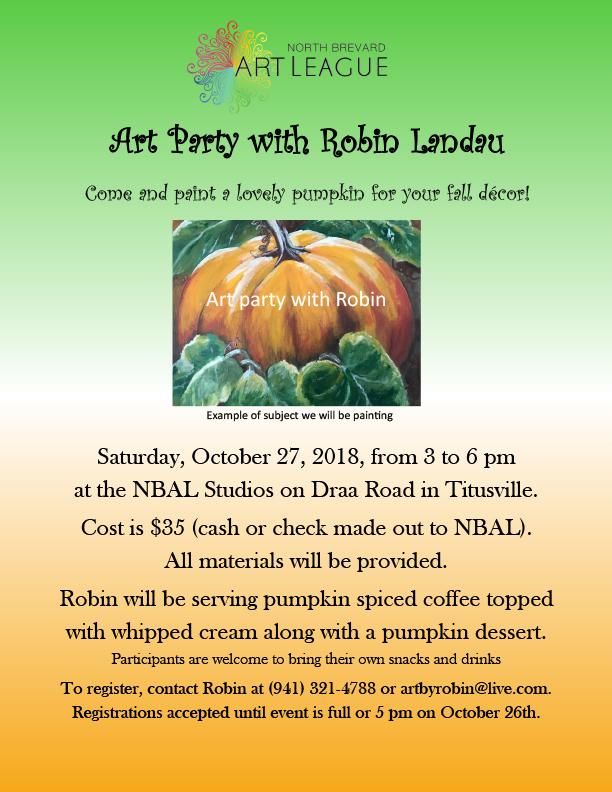 The evening is an oppurtunity to meet the artists and enjoy wine and food bites donated by ODDesigns of Cocoa Beach. 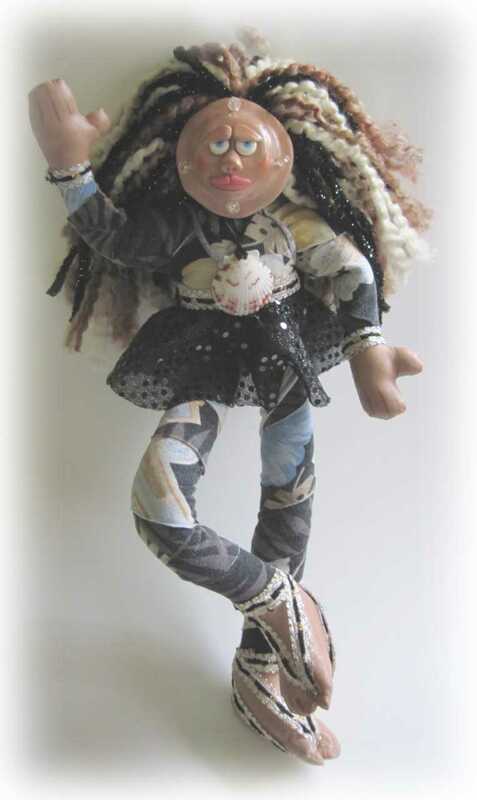 Be sure to sign up for a free drawing for “Dancer Dolly” a funky art doll created by Studios artist Linda Geiger. Winner will be notified by November 30. 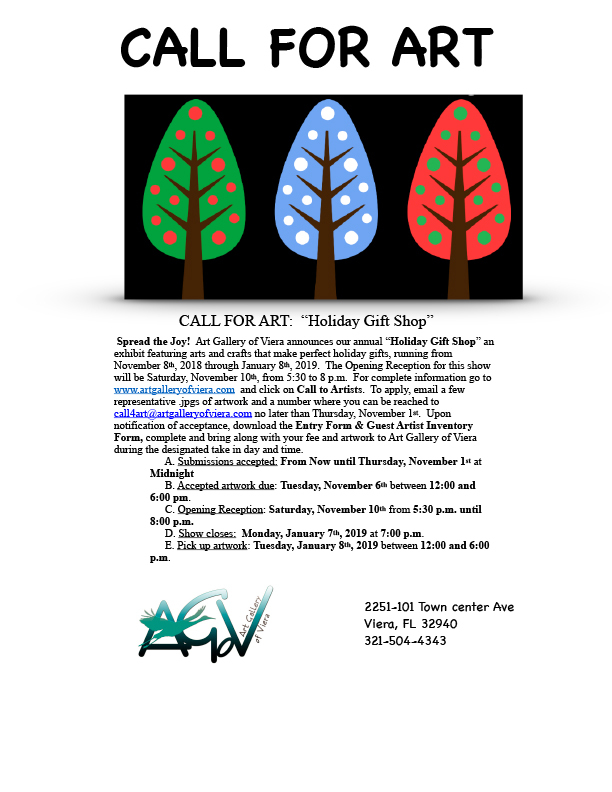 The Studios Holiday Shoppe will also be open with a wide variety of reasonably priced art for holiday gift giving. ORMOND BEACH, FL – Ocean Art Gallery continues its community commitment when it conducts “Turtle Palooza!” at its Granada Plaza location, 197 E Granada Blvd. in Ormond Beach. 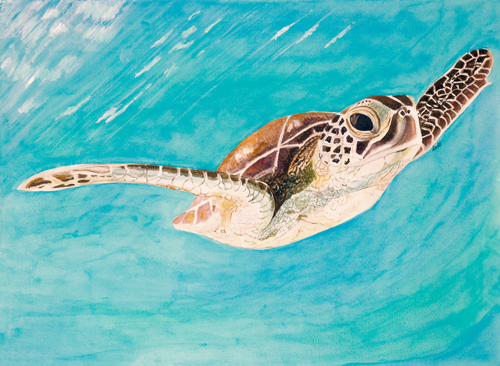 This second annual event showcasing art featuring sea turtles will raise money for the Friends of Gamble Rogers, a volunteer 501C3 group that supports the state park through various projects. The art show will have an Opening Reception at 5-8 pm on Saturday, November 3, with artists, park staff, FROGRS members, live music, and refreshments. Gallery owner Frank Gromling said, “Turtle Palooza last year was such a success that we agreed with the Friends executive board to do it again this year and into the future.” Ten percent of sea turtle art sales during November and 100% of all art raffle proceeds are donated to FROGRS. Watercolor artist and gallery co-owner Bibi Gromling donated "Amazing Grace" for this year’s raffle, with tickets $10 or three for $25. Frank and Bibi Gromling encourage all sea turtle and art lovers to buy sea turtle art and raffle tickets to benefit the local state park. Flagler County residents who might not be able to attend the Ormond Beach reception will have a special art reception on November 15, 4-7 pm, at the gallery’s Grand Living Realty Design Center location, 2298 Colbert Lane, Palm Coast. 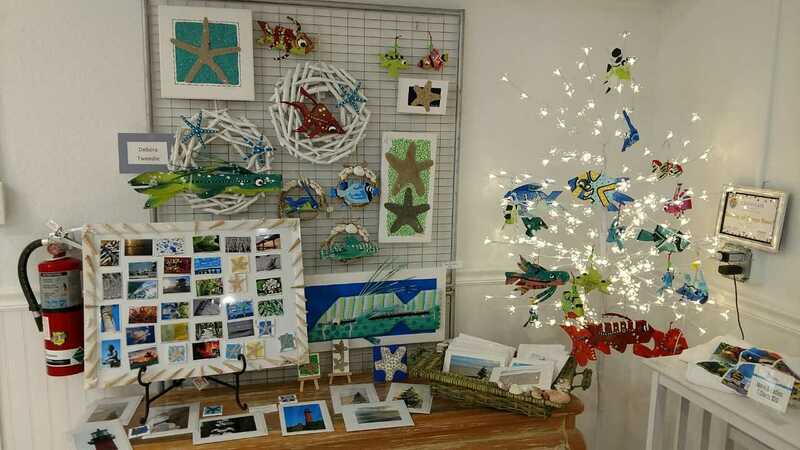 Sea turtle and other art will be for sale and raffle tickets will be available. The month-long sea turtle celebration will conclude with a Grand Finale on Friday, November 30, 5-8 pm, at the Ormond Beach gallery. Gamble Rogers staff will provide sea turtle nesting results and the winning raffle ticket will be drawn at 7:30. Ticket buyers do not have to be present to win the $300 sea turtle painting. All three events will have live music provided by the Dr. Cashband and refreshments will be served. Painting with a Frits week 2 is coming Thursday Oct. 25th. 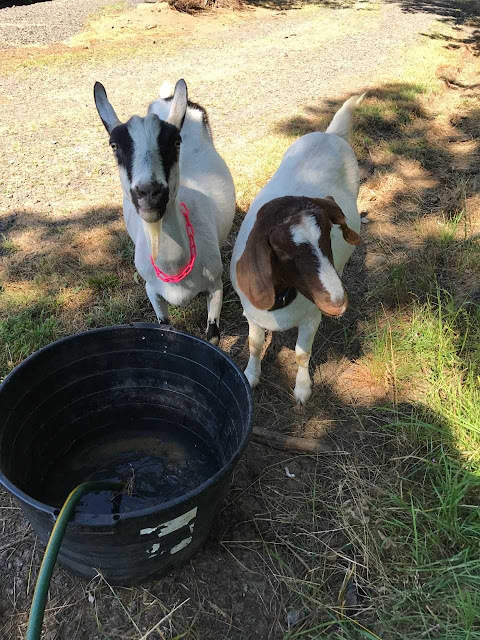 You have a choice between koi pond or goats. 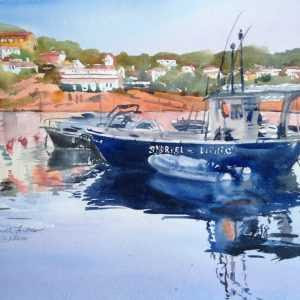 This is a great opportunity to paint with Frits Van Eeden. Classes are held at Ridley's Custom Framing on Palm Bay Road. They are currently taking reservations for Thursdays from Oct 25th through Nov 15th. You must call to make the reservation. 321-728-8811. There is an answering machine for after hour calls. Class is $53.50 and limited to 12 students. Class starts at 6pm and ends at 8:30pm. Coffee and bottled water are available. Skeebo's BBQ next door runs his lunch special for class members if you would like to come early and eat next door. The BBQ is good and so are the burgers. Attached are photos of our subjects for next week. Currently the class for the 25th is 1/2 full so if you are receiving this and have made your reservation, there is no need to call. 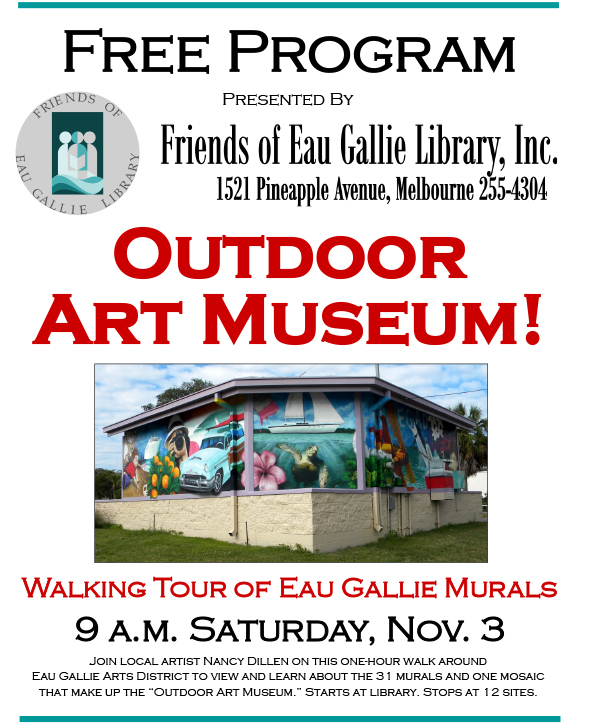 Want to discover all of the art murals, mosaics, and sculptures in Eau Gallie’s Outdoor Art Museum collection? Please join Nancy Dillen Saturday, November 3rd at 9 a.m. Meet in the lobby of the Eau Gallie Public Library. Then, take a leisurely one-hour stroll through the streets and alleys of downtown Eau Gallie to discover hidden gems. Bring your camera; you never know when you might like to have your picture taken in the jaws of a giant shark or soaring across the sky with our flying gal. 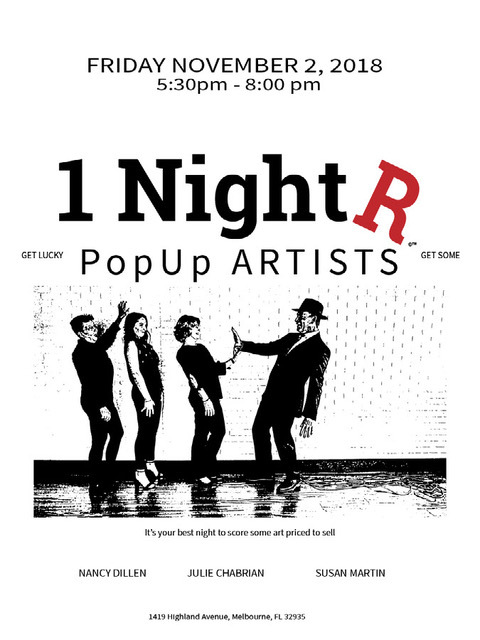 MELBOURNE, FL 1NightR Pop Up Art Event. Get lucky. 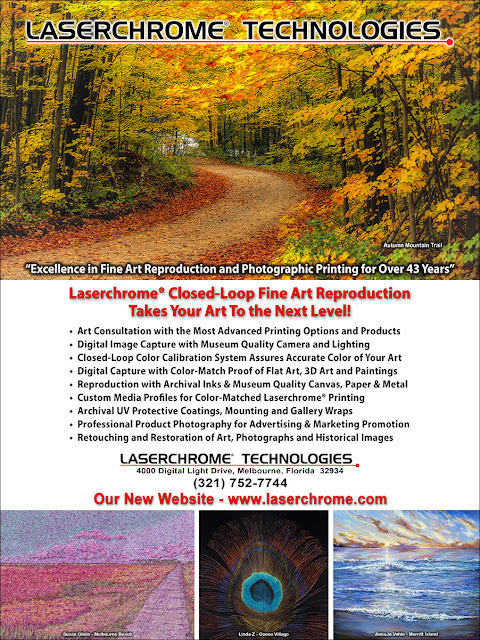 Get some great art by award winning artists: Julie Chabrian, Nancy Dillen, Julie Kessler, and Susan Martin. Artwork priced to sell. One night only! during the Eau Gallie Art District’s Friday Art Walk, November 2. Pop in at 1419 Highland Ave. across from Ralph’s Art Supply between 5:30-8:30. Events continue to present opportunities for activity, growth. Cocoa Beach Main Street, Inc. is preparing for a very active season. The winter season kickoff includes two many downtown events commencing in November. Sip n Stroll is a local favorite and has reached a regional audience. The event will be held November 3rd and is sponsored by Blue Marlin Real Estate. the City of Cocoa Beach. Tickets and business registration are available on the Main Street web site mainstreetcocoabeach.com. Each guest will receive a limited-edition silicone wine cup and will visit up to 30 local participating businesses. 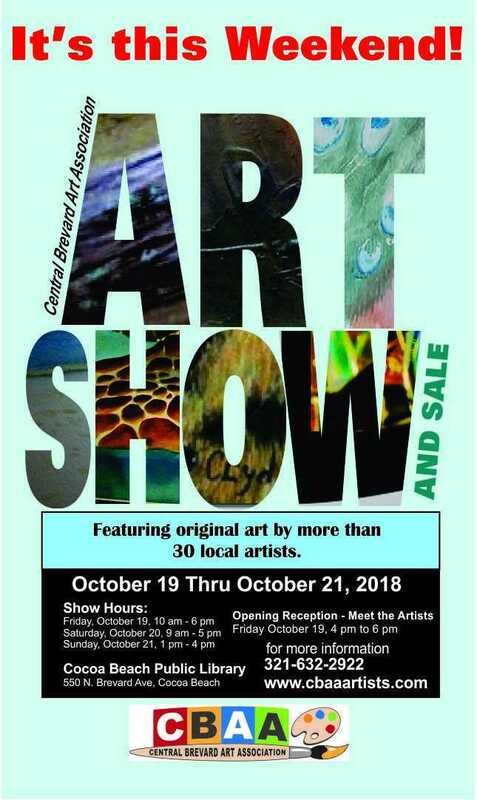 The Cocoa Beach Art show welcomes thousands of people returning for the holidays and is sponsored by Connors Wealth Management. 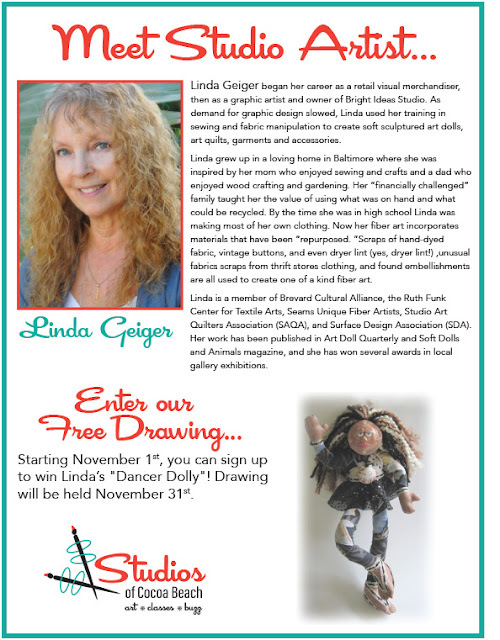 The event is managed by the Cocoa Beach Art Show Committee and will take place Thanksgiving weekend. The “Blizzard at the Beach” known as Winterfest falls on Saturday December 8th and follows the parade. Over 40 vendors, crafts and food concessionaires will line Minutemen Causeway for the 3rd annual event from 3pm to 9pm. A new year will bring exciting prospects for the Main Street program which will continue to manage and promote several signature events. Earlier this month it was announced that Cocoa Beach Main Street received a Cultural Marketing Grant from the Brevard Cultural Alliance, which is administered by the Tourist Development Council. Another opportunities is an “L.A.P” or Leadership Action Project with LEAD Brevard. The Leadership Class of 2018/2019 will collaborate on the project titled “Creating an Environmentally Sustainable Downtown”. The project aims to identify and create sustainability opportunities for the downtown, its businesses and community. Many businesses in downtown have implemented sustainability practices. Executive Director Beth Javens recently reported on the accomplishments of the program. As the director she spearheads the activities of the board but adds the volunteers, the businesses and the residents of a community are the lifeblood. “Creating a physical and illustrative landscape where residents enjoy a quality of life, businesses enjoy vitality and there are recreational opportunities for all is an ongoing dialogue”. The Cocoa Beach Main Street program continues to develop. Now in its 4th year has earned full accreditation with National Main Street Center. It is a 501c-3 not for profit. The shopping season is almost upon us. 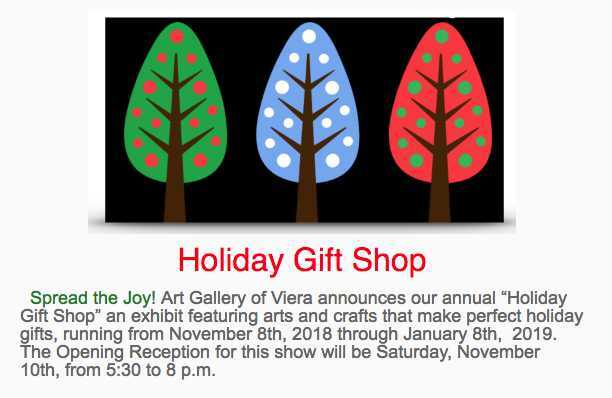 Reserve November 2, from 5:30-8:30 pm, to attend the festive First Friday Opening of the Annual Holiday Craft Show at Fifth Avenue Art Gallery. This year's event opens on October 29 and will run through January 5, 2019. Come jump start your holiday spirit, meet some of these wonderful crafters, share in some light refreshments and enjoy the beautiful collection of handcrafted artisan work. 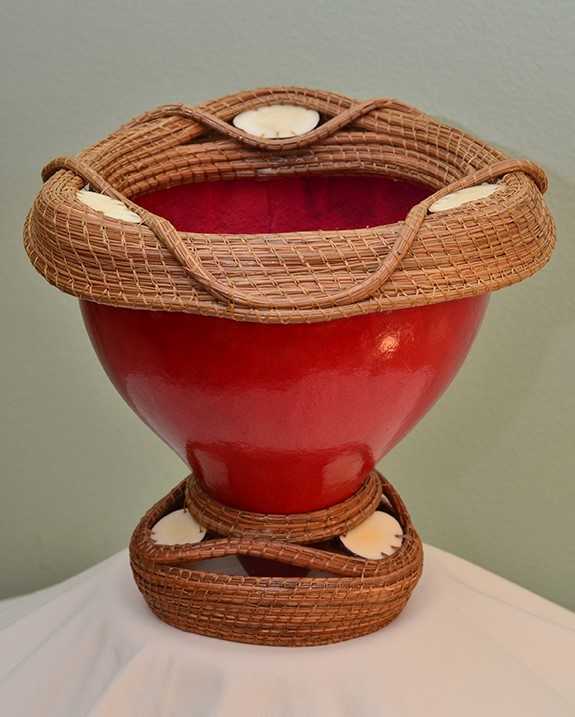 There will also be a drawing for a gift basket at the Opening Reception. The drawing will be held at the close of the evening and the winner will be notified by email. Looking for volunteers to help with ArtWorks on Saturday, November 17 and Sunday, November 18 from 9 a.m. – 6 p.m. Shifts available for variety of duties listed below.If you’re interested in this volunteer opportunity, please email tmurray@fit.edu or call 321-674-8919. Information booth: Volunteers will hand out festival programs, assist staff with selling posters, t-shirts and notecards, and answer frequently asked questions. Booth Sitters: Booth sitting requires a volunteer to take the artist’s place for 5-10 minutes while he/she takes a break. If someone comes into the booth and has questions, simply tell them the artist is on a break and will be back within a few minutes. Artists are relying on sales and will not want to leave to booth for long. Survey Crew: Publicity Survey requires volunteers to get feedback from the public on how they heard about the show. You will be given a clip board, pen and surveys. When you’ve finished, return the completed surveys to the information booth. Art Outpost: Setting up and packing up art supplies. Bring art supplies to/from Renee Foosaner Education Center and ArtOut Post. Assist instructors and participants with materials and art projects as needed. First of all.... have you seen this spectacular poster for ArtWorks. The painting is by Christopher Maslow. I just love it. I just want to make sure that you are all saving November 17th and 18th this year for the ArtWorks Eau Gallie Fine Art Festival. It's a great one for the whole family. All is bright and shiny at Sparkle at Fifth Avenue Art Gallery. 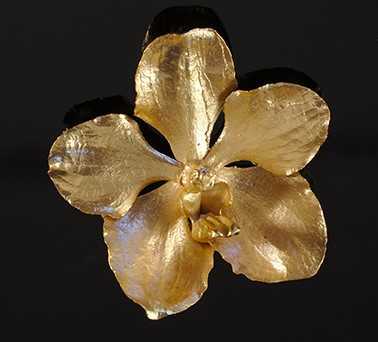 The front gallery is now a dazzling display of jewelry from award winning jewelry designers. There are precious metals, semi-precious stones, and glass. This unique exhibit will offer you a jump start on your holiday shopping, or a chance to add to your own collection of personal pieces.